Give your bike that factory look with the Tusk Impact Billet Clutch Cover. The covers are CNC machined from 6061-T6 billet aircraft aluminum and are much stronger than the stock cast cover. Each cover is finished in a hard-anodized coating to reduce boot wear to keep your cover looking brand new. The covers are made to OEM specifications to use your stock hardware and an OEM clutch cover gasket. 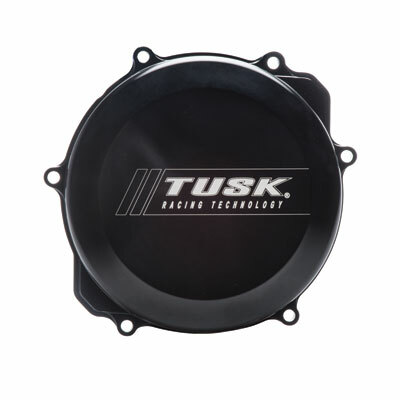 Think Tusk for all of your motorcycle, ATV, and UTV needs. Billet aluminum clutch cover gives your bike that factory look. CNC machined of a 6061-T6 billet aircraft aluminum for superior strength. Stronger than the OEM cast covers. Hard-anodized finish keeps your cover always looking like new. Made to OEM specifications to work with stock hardware and OEM gaskets.